Fatih is using Smore newsletters to spread the word online. After reviewing and having our Chapter 6 test on ordinal numbers and positional words, we will be moving unto Chapter 7, where we will study numbers to 20. 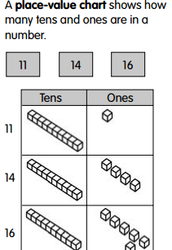 We will use a place-value chart to show numbers up to 20, show objects up to 20 as tens and ones, and compare numbers to 20 and order them by making number patterns. Students will become familiar with how to write and recognize numerals as well as written numbers 11-20.
in preparation for our Chapter 6 test on Tuesday, practice using positional words with your child. We have covered: right, left, up, down, behind, in front of, beside, between, near, and far. Additionally, practice with your child about recognizing and writing ordinal numbers. It can also be helpful to line up their toys or other items in a row and have them identify what position each object is in line (For example, the teddy bear is fourth from the left and third from the right. It is between the race car and the toy robot. ).